There is plenty of good content out there right now, but if you take a closer look, you’ll discover that there’s very little great content. Fortunately, the path to great content is simpler than you think. 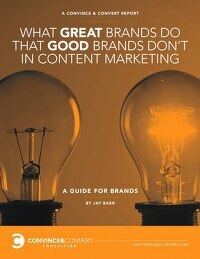 All you have to do is look to the five key characteristics that great brands do and good brands don’t when it comes to content marketing. Let’s work together to make exceptional content marketing your competitive advantage. Take a look at how we help some of the largest companies in the world with their content marketing, and if you think it makes sense to chat, please let me know. We look forward to getting to know you!